Happy Owl Glassworks is so adorable. When I first heard about them, I immediately purchased an owl pin for my jacket. For $8, you really can't go wrong. Now, I've spotted the absolute cutest item for the home. It's a night light made of fused glass with a little owl that makes every bump in the night a lot less spooky. You can also select a chubby little bunny night light. Each cost around $40. 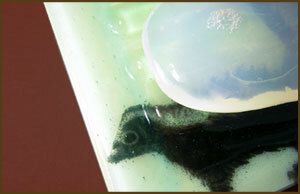 They've also expanded their line to include a fused glass "skunk" soap dish (shown in photo). Can't think of a smarter image for hands that go from smelly and dirty to squeaky clean! Oh, and there's talk of a sale coming up in the next few weeks so make sure you log onto their website after January 14th... Let me know what you find! Barneys New York + Others Coming to Boston!